Instagram has been a powerful tool for me. Not only do I get to connect with inspiring parents everyday but I’ve also been able to unlock a network of brilliant toymakers across all corners of the world. From Romania to California to Greece — in the span of weeks I’ve spoken with so many talented makers. I had come across Ouistitine relatively early in my Instagram journey. At the time, I was obsessed with finding the perfect set of hand puppets for the shop. Not only was puppetry theatre a staple in my family growing up, it’s also a powerful tool to kickstart imaginative play. Besides carrying the exact puppets I’d imagined for the shop (natural, not cartoonish), Ouistitine was also located in my backyard — within a few weeks I was on my way to see the puppets in real life. Stepping into the shop was like walking into a childhood dream sequence. It was warm and homey. Each toy on display was made out of natural, earthy materials with craftsmanship pouring out of every stitch. Absolute heaven! I was greeted by Camille, the founder of Ouistitine, and her mother Sylvie, a key partner to Camille in the toy making process. Together these women are dedicated to creating natural toys that foster quality play time for children of all ages. Over the course of the morning, we spoke at great lengths about the importance of long-lasting toys, Camille’s drive to embed sustainability into every step of the toy making process and how we can increase access to quality toys for children across all socio-economic backgrounds. Ouistitine is located in Lachine, Montreal — a working class neighbourhood with a population that falls into the lower socio-economic bracket. Camille and her mother explained how children often rush into the store and are drawn to the puppets and dolls as if by a spell. “They can feel the quality and how special the toys are. They want to take them home!” Says Sylvie. “Some parents say okay we will save and invest in this one quality toy. Where others say, are you crazy 30$ for a puppet?” Camille explains. For Camille, there is still an educational component that needs to be done on quality toys and how they’re built to last for ages (even be passed down to other siblings) versus the cheaply manufactured playthings that people find at the sales bin at Toys-R-Us which fall apart after a few uses. The bottom line is that Camille wishes all kids could have access to her quality toys. She’s even taken steps to offer workshops to kids and their families on how to make their own toys. That way families only need to pay for the materials and can learn the assembly themselves! 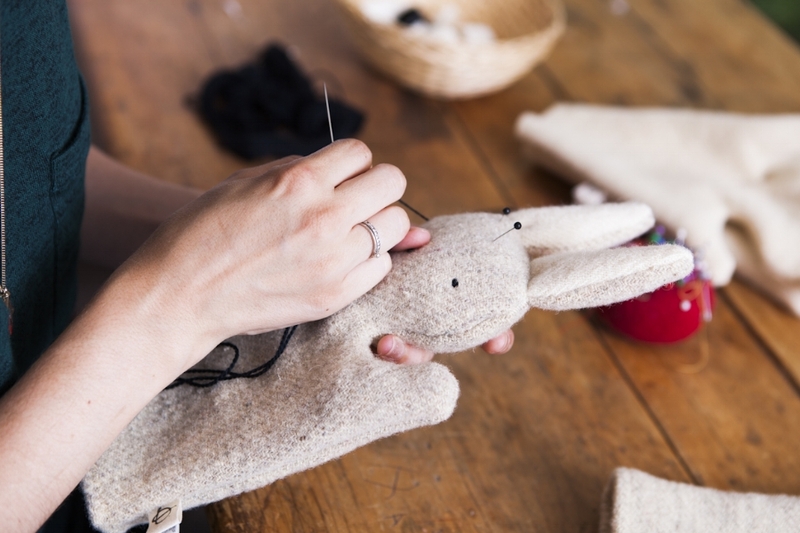 Ouistitine toys are not only made out of natural materials like sheep’s wool from New Brunswick but also reused materials like old sweaters found in second hand shops. Recently, Camille has taken some bold steps into working with people in the fashion industry to turn their useless scraps leftover from making clothes into useful toys for children. While the partnerships have been successful, the foray into this new world has been difficult as the fashion industry is still grappling with the taboos of just how much they waste produce. Ouistitine uses natural sheep's wool from New Brunswick 🇨🇦 because it adds 'the weight of life' to the toys. Camille sent me home with three puppets to test out. A bear, a bunny and a pig — oh my! Over the past month, I have pulled out these new friends on many occasions and each time they have been a pleasure and joy to play with. On the hand, the puppets are soft but sturdy — they offer plenty of control to express many different gestures making for complex characters and story narratives. One of the most exciting elements of these puppets is their minimalist facial features. By having a simple set of dotted eyes and no mouth, children can explore a wide range of emotions during their playtime with these puppets— the pig can go from being sad to happy to scared all within a matter of minutes. Camille and Sylvie are heavily influenced by the Waldorf philosophy of toys having minimalist facial features. This allows children to attribute their own characteristics and emotions to the toy versus having it prescribed to them by the toymakers choices. “Why do toys always look so happy? There’s no fun in always playing happy — sometimes you get angry and want to explore that through the toy!”, explains Camille. Ultimately, there’s more educational breadth in having toys with minimal facial characteristics. Ouistitine's hand puppets make for quality imaginative play amongst children and parents alike! A Few Good Toys will most definitely carry Ouistitine hand puppets when the shop launches (stay tuned!) as our brands share similar values and vision. In the meantime, feel free to check out the shop's collection online if you're itching to get your hand on these darlings!